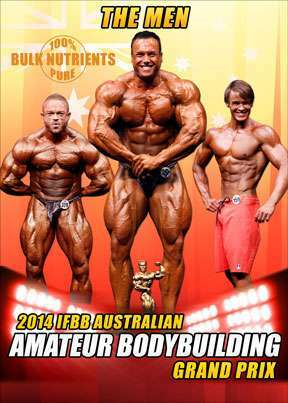 See the complete Men’s Competition at the 2014 IFBB Australian Amateur Bodybuilding Grand Prix. Nothing from the contest has been omitted. The 3 Pro Qualifiers were Josh Lenartowicz – Men’s Open, Gary Wright – Men’s 212 and James Cant in Men’s Physique. The 3 Pro Qualifiers were Josh Lenartowicz – Men’s Open, Gary Wright – Men’s 212 and James Cant in Men’s Physique. INDEX OF DVDs FROM AUSTRALIAN GRAND PRIX EVENTS. 2014 IFBB AUSTRALIAN PRO GRAND PRIX RESULTS.